Wind erosion in boreal environments often takes the shape of snowdrifts that impact locality of vegetation and topography. 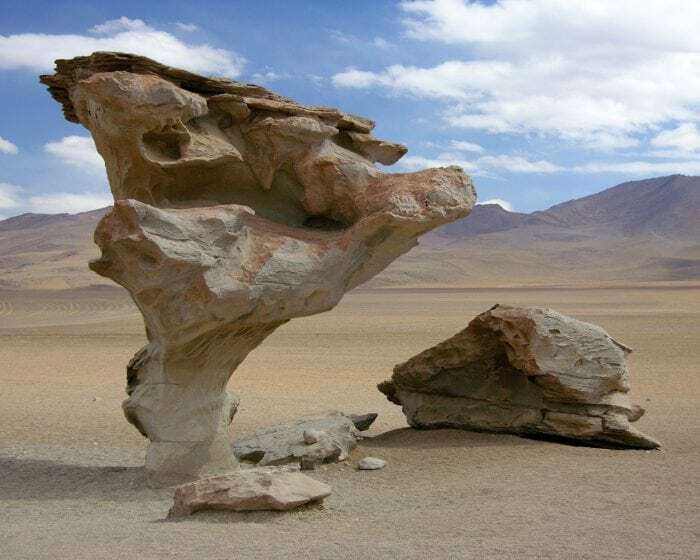 Aeolian processes entail work done by the wind on the earth, usually as a form of erosion, transportation, or deposition. Although aeolian processes have been studied for a long time, including several extensive texts dealing with these processes, the vast majority of research has been done in warm desert environments. Thus, it is necessary to extrapolate data and conclusions in the warm desert environments and attempt to apply it to the boreal region. Due to this concentration of eolian processes studies in warm deserts and a lack of quantitative analysis of these processes in the boreal, much of the knowledge known is qualitative. Little quantitative analyses exist for the boreal region. These processes have a critical impact on the characteristics of the boreal environment, leading to effects all akin to this specific climate. This paper examines and explains the eolian processes that take place in the boreal regions of the world, restricting the locations to Canada and Alaska. Three main objectives are examined. The first will be the limiting factors, in general, and those specific to the boreal, which determine the characteristics and efficacy of Aeolian processes. The second will be specific eolian processes in the boreal including erosion, deposition, mechanisms, and landforms; in this section rates and other quantitative data will be presented for the particular process. Finally, this paper will compare factors, processes, and ensuing landforms in the boreal with those of warm desert environments. There are several factors that influence eolian processes including but not limited to, the presence, magnitude, and direction of wind, the local topography, vegetation, precipitation, and glaciation. Since the focal point of this paper is concentrated on the boreal region it is necessary to fully understand its climactic traits. The boreal region consists of the upper parts of Canada and the majority of Alaska. It is generally covered with tundra, the equivalent of a cold desert, as well as areas of boreal forest. The boreal region is known for its extensive, very cold winters followed by ephemeral warm summers. It is home to some of the most extreme temperature variations on the planet, with winters dipping to approximately -40° Celsius and the summers warming to over 30° Celsius. For the majority of the year, the temperatures are below freezing and the soil and subsoil freeze down to several meters. The vegetation is sparse with mainly hardy species that can survive the harsh winters including ferns, evergreens, and conifers. The precipitation is very low in most of the boreal, consisting usually of no more than 20 inches of rain over the entire year, leaving the ground dry for most of the time and susceptible to eolian processes. Precipitation is more prevalent along the coasts and where mountains induce the orographic effect. The effect of wind on transportation is directly proportional to the amount of topography on the surface, the less foliage the more the wind is able to transport fine-grained sand, snow, and loess. Roughness of the surface slows wind velocity near the ground. Since wind’s velocity increases with the height above ground, impeding wind’s movement on the surface decreases transport. The empirical equation, U/U* = (1/k) ln (Z/Zo), known as the law of the wall is a principle equation used in fluid dynamics to predict the velocity of wind at a certain height. An increase in the roughness of the terrain leads to and increase in the surface shear stress and ultimately affects U* as well as the wind flow velocity. The thickness of this zone, the boundary layer, is conversely proportional to the velocity of the wind. This means that the rougher the surface is the slower the velocity will be in that initial height above the ground. 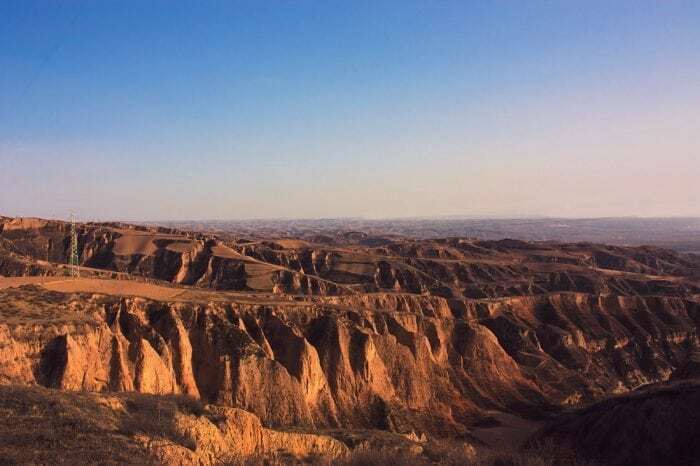 “Loess Plateau geomorphology” by 黄河山曲 via Wikimedia Commons is licensed under the Creative Commons Attribution-Share Alike 3.0 Unported license. Moisture in the surface material is another factor that influences the susceptibility of sediments on wind processes. Fine sediments become more cohesive when moisture is added to them. This causes the sediments to aggregate and forms larger particle sizes, thus making them harder to transport by wind. This, in turn, goes hand in hand with precipitation. Precipitation in the form of dry snow does not add moisture to the sediment but precipitation in the form of rain causes an increase in the moisture of the active layer of sediment. Therefore, dry climates are much more susceptible to eolian processes than wet climates. Sediment is another key factor in eolian processes. An environment can be rich in sediment or sediment starved, this being determined by a number of characteristics that determine erosion and transportation of sediment in an environment. Eolian processes rely on sediment, if sediment is lacking, the wind will have nothing to entrain, and thus do work on. Depending on different environments, the sediment present may range from silt and loess to cobbles. The size of sediment present also influences eolian processes, as a much faster wind velocity is needed to entrain cobbles than silt. Since boreal climates have little vegetation, which is one of the variables in U* in nature, the U* value is relatively low and thus creating higher wind velocities right above the ground. This gives more opportunity for wind transport of sediments. Both boreal regions of the earth and warm desert environments typically have strong prevailing winds, although these can vary from region to region. Due to the lack of vegetation in warm desert environments, this leads to a very low roughness, having only sand grains as a factor in roughness. Although most of the boreal is not covered in much vegetation, there is more so than warm desert environments. This causes the roughness coefficient to increase for the boreal and limit wind’s ability to erode and transport sediment. Although this sediment is easily transported by wind, it is short-lived as the majority of sediment is produced in early spring when a thin film of water forms under glaciers and facilitate their movement and thus erosion. During the winter months of the year, after the system is sediment starved from the removal of all eroded sediment by eolian processes, the primary object that is transported and deposited by eolian processes is snow. This differs from warm desert environments because warm deserts typically have an excess of sediment to be transported by wind. Therefore throughout the length of the year eolian processes do work on warm deserts, eroding, transporting, and depositing. When comparing sediments in warm dry deserts to the boreal region there is significant variation in moisture content. Warm deserts are described as having precipitation on the order of approximately 15cm/yr. This, combined with the effect of drastic evaporation leaves the soil in deserts very dry. Boreal environments have more precipitation typically than dry deserts, although not substantially more. This, coupled with permafrost, defines wind’s ability to transport when dealing with moisture. Precipitation in the boreal is often in the form of snow, and as the temperatures are well below freezing the snow is dry. Permafrost keeps the surface soil layer moist deteriorating wind’s ability to transport sediments. Loess is a major sediment type that is entrained from wind in the boreal, usually referred to during the Pleistocene age. Loess refers to any sediment, usually clay and silt, which is transported by wind to another location accumulating to comprise a soil layer. It is typically between 0.01 and 0.06 mm in size and 99.5% are below 0.2mm. Due to loess’s wide range of composition and percentages of typical minerals, it is often easy to denote where the loess came from, thus interpolating the wind direction and location of erosion. Due to loess’s small mean diameter, wind easily crosses the critical shear stress and entrains loess for periods extending up to years. Depending on the direction, intensity, and duration of the wind, loess can be transported anywhere in the world but typically it is deposited in the direction of the wind. Loess deposits typically have a pattern of the heaviest loess deposition near the source with a gradual decrease in deposition away from the source in the direction of the prevailing wind. In a study done by Muhs et al. (2003), loess deposits were measured in Zagoskin Lake, on St. Michael Island, in western Alaska. They believe the loess was entrained by northeasterly winds from glaciofluvial sediments. Due to the underlying basalt rock in Zagoskin lake and the predominantly felsic loess, it was relatively simple to denote what was loess and to predict its source. During the last glacial period Muhs et al. calculated estimated a mass accumulation rate from approximately 125 to 700 g m-2 yr-1, which is comparable to the mass accumulation rates calculated for other parts of Alaska during the last glacial period. Although ventifacts and wind abrasion are typical terms when hearing about wind processes as a geomorphic agent in warm deserts, it is a common tool of erosion in the boreal as well. In the boreal stones may become abraded not only by sediment grains but they can also be eroded by snow and ice crystals. It has been experimentally determined that ice at 0 degrees Celsius has a hardness of 1.5 to 2.0 according to the Mohs hardness scale. The hardness of ice increases as the temperature decreases, exhibiting a hardness of around 6 at -50 degrees Celsius. These stones show the typical pitting, fluting, or grooving seen in warm desert environments. In a study done by Tedrow (1977), in Prince Patrick Island of Canada, they found rocks sculpted by wind. Ventifact abraded by wind in Prince Patrick Island, Canada. It upholds strong evidence of abrasion by snow because the ventifacts in the area are surrounded by stone pavement, preventing sand from being used as an abrasion tool. These ventifacts provide evidence that wind abrasion is present and in many cases, ice is being used as the abrasion tool. In many sub-arctic climates peat covers the ground and therefore peat abrasion is significant. A study done by Cummings and Pollard in 1990 found that in Schefferville, Quebec during two successive winters approximately 18cm of surface peat was eroded. In another study done by Seppala in 2001, it was found that wind abraded more than 40cm thick layers of peat in Finnish Lapland. The erosion of fine-grained particles by wind is called deflation and is a major process that occurs in the boreal. This removal of fine-grained particles continues until the bare stony surface is exposed. In this instance, the fine-grained particles may be silt, loess, or snow. Although deflation due to wind transport causes landforms of different variability and at different depths, it is always associated with a degradation of the topography. Some typical formations are deflation hollows or blowouts, which are shallow depressions caused by deflation, usually in circular or elongate shapes. Deflation is aided by the destruction of vegetation or lack of vegetation, making it a prevalent process in boreal landscapes. There is a positive feedback cycle, windblown sediment buries plants as well as uncovers roots, this causes many plants to die, which loosens the soil for more deflation and inhibits plant growth. Deflation also is limited in depth by the water table or point at which the sediment begins to become moist. This moisture in the sediment causes cohesion, making it difficult to erode. Blowouts in Finnish Lapland are over 10m in depth and cover several tens of thousands of meters squared. The slopes are normally steep, at approximately 35 degrees, the slip angle of eolian sand. Deflation is a predominant process in the boreal as well as warm desert environments. In the boreal, most of what is deflated is snow, silt, or loess, while those in warm desert environments often involve deflation of fine quartz grains as well as other fine sediments. The water table in the boreal is typically much more prevalent and higher than that in the warm desert environments and thus blowouts are limited more in the boreal than in warm desert environments. Snowdrift is an important process that takes place in the boreal. Wind transports snow anywhere where fresh snow and wind is present, wind can transport snow by creep, saltation, and turbulent diffusion, much like that of sand with wind. Snow particles typically have a diameter of approximately 0.5mm and the threshold velocity for transportation is around 0.1 to 0.2 m s-1. 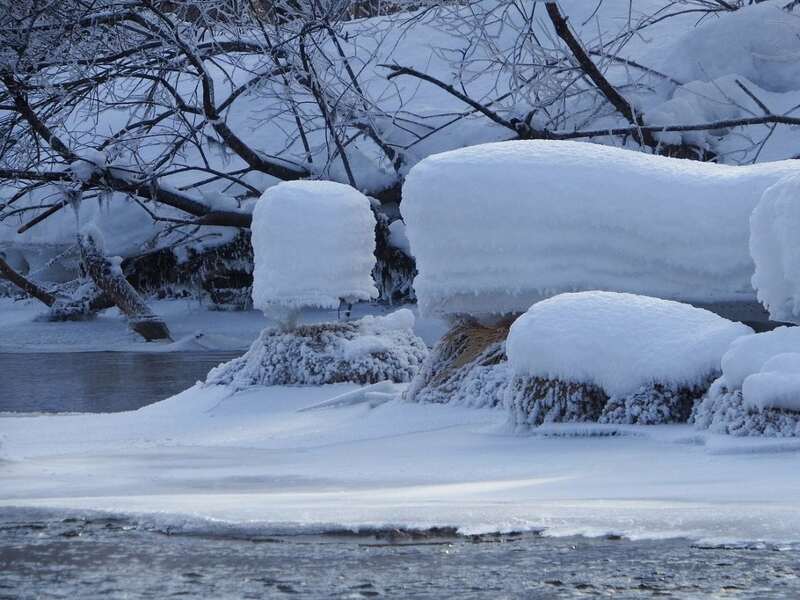 Snowdrift affects the formation of glaciers and topography in boreal climates. As snow falls it accumulates approximately evenly over the surface on which it falls. Due to the very cold climate, the snow in the boreal is dry and thus is very light and can be transported easily. Through time and repetitive windy events, a large portion of snow can be transported. This causes thin spots in snow cover and accumulation in others. This is usually due to some topographical impediment of transportation, typically vegetation, outcrops, or mountains. This creates ideal situations for glaciers, as they are formed under the weight of their own snow. The accumulation of snow in particular locations due to consistent wind patterns causes thick covers of snow and thus the snow compacts under its own weight. This eventually leads to a glacier, when the snow is so compacted that there are no longer air vesicles in the snow. When examining the broad category of eolian processes it becomes evident that the variability and magnitude of wind, precipitation, surface roughness, and sediment type and supply all contribute to form eolian processes unique to specific regions. Although these factors play different roles in altering eolian processes in different areas of the world, they all share common characteristics of wind erosion, transportation, and deposition. As further strides in eolian processes are made, geologist will have a better understanding of its processes and characteristics. Although much of the concentration of eolian processes has been in the warm desert climate, there continue to be quantitative leaps in the boreal environment. Further knowledge of the effects of wind on the boreal environment would aid geologists in deciphering chronological histories of snowfall, predominant wind patterns, areas of local erosion, as well as broadly contributing to an understanding of the boreal environment.